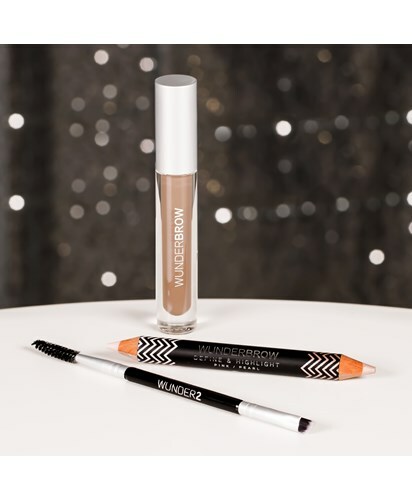 Description The WUNDER2 ‘All About Brows’ Set is the ultimate gift for brow mavens! The holographic giftbox includes three eyebrow staples for a perfect, alluring arch this holiday season: - Wunderbrow Eyebrow Gel: Waterproof, smudge-proof and transfer-proof, this award-winning beauty formula lasts for up to three days. - Dual Precision Brush: For ideal Wunderbrow application. - NEW! Define & Highlight: This dual-ended pencil highlights and illuminates the brow bones with a creamy, easy-gliding formula . Available in black/brown and brunette shades.